Published in Rafu Shimpo, October 2, 1950. 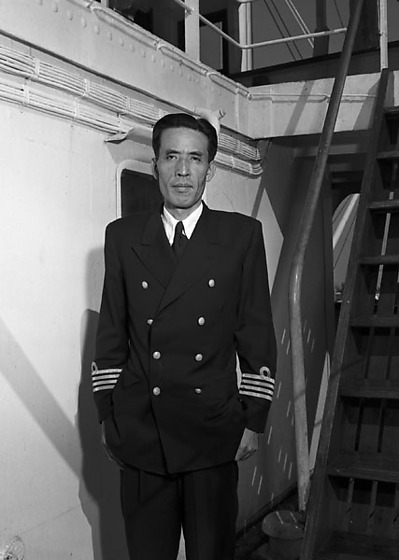 Japanese and Caucasian men in suits and uniform inside a room and on deck of a ship, Nichinan Maru, in Los Angeles Harbor, Los Angeles, California, October 1, 1950. Includes Japanese presenting gifts, portrait of Captain Kiyoshi Yukawa of Nichinan Maru, and two men, Ketsushi and Tomio Hanada, officials of Iino Kaiun, the company that contracted the tanker. Written on original negative envelope: Nichinan Maru -- Los Angeles Harbor.